Below are some of the highlights from Mercy Philadelphia Hospital’s first 100 years. The light gray panel below includes a link to more photos, which can be viewed on Flickr. Farmland in West Philadelphia was purchased and deeded as the site of the future institution. On February 4, the Sisters of Mercy paid a $10,000 down payment to purchase the lot on 54th Street and Cedar Avenue. The total price for the land was $108,000. Click image to view larger. The first class of nurses graduated from the Misericordia Hospital School of Nursing. Misericordia hospital began its graduate medical education program, accepting the first medical and surgical interns. Sr. Mary Liguori Cantlin, RSM, MD, was the first Sister of Mercy certified as a surgeon by the American Board of Surgeons. The Mercy Radiation Center was opened and equipped with the first cobalt therapy unit installed by any Catholic hospital in Philadelphia. The installation of powerful cobalt therapy machine was completed in 1965, on the 20th anniversary of the atomic bombing of Hiroshima. Pictured: Dr. Rominger with a nurse and cobalt therapy patient. The last nursing class graduated from the School of Nursing at Misericordia Hospital in December 1971. The hospital launched a five-year, $52 million renovation and building project, which included renovated surgical suites and recovery rooms, upgraded nursing units and patient rooms, and new imaging technology. On January 8, Franciscan Sisters of Allegheny Health System, Eastern Mercy Health System, and Sisters of Providence Health System combined legally and operationally to create Catholic Health East (CHE). Catholic Health East and Trinity Health combined to form a new organization, becoming the second largest Catholic healthcare provider in the U.S. The new name became Trinity Health and included a new branding identity and strategy for the system. The Sisters of Mercy turned over sponsorship of Mercy Health System to Catholic Health Ministries. Mercy Philadelphia Hospital began construction of an Emergency Department (ED) expansion and renovation project. Construction is expected to continue through December 2019. This $15 million project will double the size of the ED, making it more accessible for colleagues and patients. Pictured: Rendering of new ED. Take a look back at Mercy Philadelphia Hospital’s rich history over the last century. 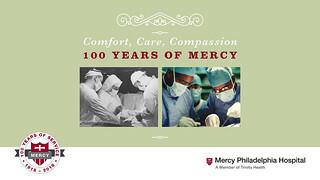 Mercy Philadelphia Hospital has been serving the communities of West and Southwest Philadelphia for a century. In this video, current and former colleagues, physicians, board members and volunteers talk about Mercy Philadelphia Hospital’s history and its future.